I don't know if there are two phrases that gamers love more than "Collector's Edition" and "Anniversary Edition". Ask any Axis & Allies fan about the Anniversary Edition that was released around Christmas of 2008 and they'll get this wistful and glow-y look about them, or in some cases they'll get a frustrated and angered look and you'll know that they missed out. Ask Euro Game fans about the Collector's Treasure Chest Edition of Settlers of Catan, and the drool will start to pour from all corners; it's certainly a site to behold. Most of the time these are the kind of games that only really serious collectors and those with some serious expendable income will even consider taking home with them, but they are the kinds of games that everyone who loves board games of any kind wishes was part of their home collection. This game is no different. 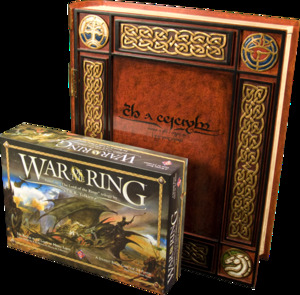 Not to be confused with the Strategy Game released by SPI in 1977, this War of the Ring is from Fantasy Flight Games and has been a staple of Tolkien fans and War Game connesuirs since it's release in 2004. It's currently ranked the 16th best overall game on Boardgamegeek.com and is, perhaps more interestingly, the 7th best War Game on Boardgamegeek. This reissue of the game is massive, really massive ... I mean the original game was massive, this is ... Enormous. It speaks for itself, in several languages, and with an intimidating baritone/bass the likes of James Earl Jones. This is a serious game. - Gorgeously painted wooden and resin box expertly crafted to resemble an ancient elven tome. Its cover adorned with elvish calligraphy. - Individual velvet-lined compartments, which accommodate the game’s many components. - 246 exquisitely hand-painted miniatures (including a special Gollum figure previously only available through promotions, and a never-before-seen Nazgûl figure). - An updated game board, 25% larger than that of the standard edition. - Revised, larger, and easier to read game cards. - All-new art by John Howe as well as elvish calligraphy by Daniel Reeve and David Salo. - An embroidered velvet bag to use for drawing Hunt tiles. - Specially-molded marbled dice and updated tokens. - An updated 80-page rulebook, faux leather-bound, featuring a gold-embossed title, and several full page, full color illustrations by John Howe. That's a murderer's row of features if I've ever seen one. Now why would I tell you about all of this? Why would I aggravate your salivary gland so brazenly? Well, it's because we have two of them at the Saint Charles store ... Yeah, you heard me right. And it's only $500.00 ... That tax return is looking mighty good right about now if I you know what I'm saying.